No city in the world hosts entrepreneurial trade shows and educational seminars with an atmosphere quite as richly layered as Las Vegas. That’s the most obvious selling point. Beneath the bright lights, however, every step you take treads on a legacy spanning more than 85 years of opportunities created and seized from nothing. What began in the 1930s as an oasis of carousing envisioned for the entertainment of workers laboring to build the then-Boulder Dam (today, renamed Hoover Dam in dedication to the Great Depression-era president who presided over its construction) evolved with the end of Prohibition and Nevada’s legalization of gambling to attract servicemen from newly minted Nellis Air Force Base at the start of World War II and then exploded into a post-war boom as America let its hair down with the return of its fighting men and women. Las Vegas as we know it today culminates over 85 years of evolution underscoring every chapter in the maturation of a nation’s changing identity. Every attraction is a master class in either inventively meeting demand like no other tourist destination could or redefining entertainment entirely. It is a living textbook chronicling independent business development from sands to riches. Consequently, there is no better place for ambitious businessmen and women from enterprising startup founders to corporate leaders to be inspired by literal shining lessons in every stage of starting, running and growing an incomparably successful business. To retain its attractiveness to throngs of tourists spanning every demographic, Las Vegas loves to place burgeoning trends of every variety center-stage at any opportunity. That goes for its marquee trade shows, such as the annual Consumer Electronics Expo, as undeniably as it does for approach to entertainment. After all, what better place to put a flame beneath a fresh product than a world-famous Mecca of modernity? 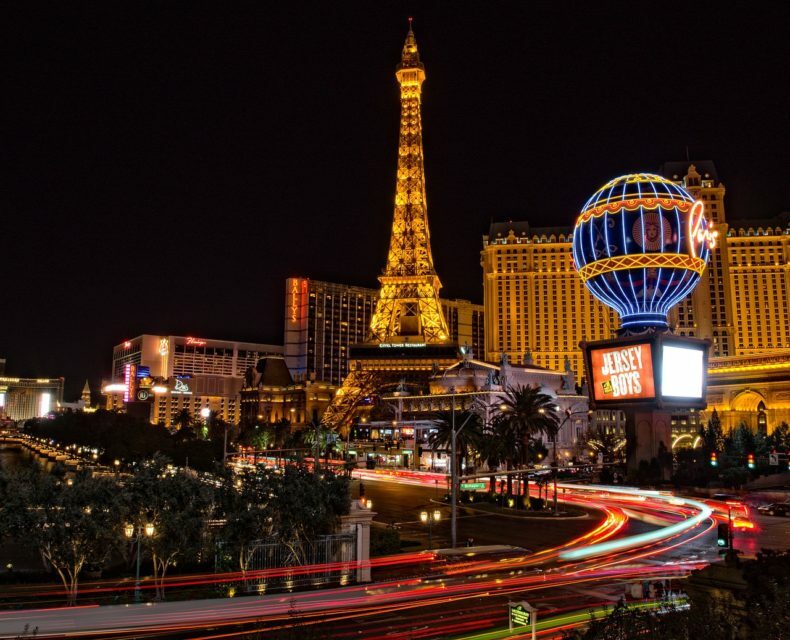 If you want to rest your finger solidly on the pulse of everything new that now makes the world turn, there are few better places to start than taking a look around Sin City. Considering that Las Vegas hosts some of the most talked-about and well-attended trade shows and seminars in any given calendar year, there is no better place to instantly turn eyes toward your product. At the right event, you may find yourself with a chance to get countless influencers in your field talking about your showcase by making a single well-crafted impression. As gambles go, this is a bet worth taking. For all the sideshow revelry peaking at any time, remember that what you learn here could lay the groundwork for breakthrough support to your customers and clients through a wealth of resources these events have to offer. Your investment in educating yourself on the cutting edge of your industry and its trends passes along dividends to the people who, in turn, choose to invest in what your company does. Every moment you aren’t taking notes at a keynote, your closest competitor just might be. Question: who do you think knows your products and services better than anyone else on Earth? Any answer except “the people who pay for them” is patently incorrect. Yes, you might have designed what you sell and how you sell people on it from the ground up. Nothing you make is really made “for you,” though. You set out to better the lives of people who offer you their hard-earned money. If you want to map a brilliant future for your brand, listen to them before anybody else. It’s one thing to read a blog, e-book or provocative social-media treatise from your industry’s most vaunted influencers and experts. Meeting these names among names face-to-face can change the way you look at what you do. Beyond receiving simple advice and maybe even making a profound statement to someone who can bend some powerful ears with ease, shaking hands with our measuring sticks for success can renew inspiration and drive to simply be the best at what you do. It’s like looking into a mirror and seeing a possible future realization of everything you could rise to achieve. Here’s a little secret about professional motivational speakers – two of them, actually: first, there is nothing in all the world that thrills any of us quite like meeting the people we address face-to-face and taking in the stark understanding of how we impact the individuals who comprise our audiences; second, and of arguably even greater importance, the people we personally encounter frequently end up influencing the directions our future talks adopt. Leaving that kind of indelible mark can foster much more than just a place in our ongoing presentations. It can spark friendships and networking opportunities that shift the courses of careers. Look, your colleagues are really no different from any other people on the planet. That includes the paralysis of mutual shyness or insecurity. Take a long look at that gathering of attendees splitting an appetizer with an empty seat. If you walk up and ask to sit with them, you might be politely rebuffed. Then again, they could tell you to pull up a chair and introduce yourself. It’s also entirely possible that, instead of a one-off lunch with a few fellow wanderers, you ultimately set off a conversation that leads to lasting relationships and contact info exchanged to keep ties closer after the convention is said and done. Here’s the real kicker: they might just be as afraid to strike up conversations with strangers as you are. Be the spark. Big trade shows mean attention from widely read trade publications. Want to get noticed and keep your name on every pair of lips across your industry? If the opportunity arises, give niche journalists some thought-provoking bulletin board material about what you do, the future of your profession, and what your heart of hearts tells you your products mean to the people who believe in your brand. This is one of the pillars every trade show: nobody wants to pass up a chance to size up competitors up-close and personally. Colleagues and rivals will never lay their cards more plainly on the table than they will with a trade show booth behind them. Take a deep breath and be honest with yourself about comparing and contrasting both your strengths and weaknesses relative to the competition who would have your customers for themselves. The sooner you can size up a potential adversary who might make a play for your market share, the earlier you can start shoring up any windows they might find to meet demand you can’t. If you aren’t gathering intel on rising competitors, you should at least be evaluating vendors and suppliers who might offer you an edge in improving your bottom line. No tide raises all ships quite like members from all walks of a single industry gathering to pool their collective experience. Education and memory fuel ideas by investing time and patience. Combine a conference room full of individual minds and everyone lends someone else a thought, comment, factoid or observation that an unconscious mind processes passively until some immediate situation recognizes its value and parses it into a solution to a problem or question. Now, imagine dozens or even hundreds of exchanges like that going on at once while like-minded people discuss their livelihood. That’s how an industry’s basic knowledge grows. Blogs, podcasts and social media will make you recognizable. Networking, actual face-time, will make you memorable. Meeting people face-to-face promotes idea exchanges in real time that no innovation yet has ever matched. The allies your company gains may be friends of friends of somebody you happened to meet who has a superb memory for people and a gift for recognizing when the right minds could do great things together. There’s no better place to leave safety and security behind than in the throes of a chill environment like Las Vegas. This is the time to be bold with yourself. Strike up conversations. Offer an original thought that you would fear might rock the boat a little bit too hard at an ordinary workplace function. Immerse yourself in learning about some hitherto unknown skill. You have nothing to lose at a trade show and complete freedom to explore what you have to gain. Enjoy it. As invaluable a resource as a trade show can be for tasting new opportunities and introducing yourself to new skills, they can also present some outstanding refresher courses. The elements that build great businesses are sometimes the most easily forgotten once success finally reaches our doorsteps. Take the time to re-introduce yourself to the classic fundamentals of your trade. Re-learning how to chop wood and carry water just might cast a new light on something you could be doing either better or differently in a game-changing way. The office and the real “work” of your work will still be there when you get home. Chances are, you are surrounded by colleagues, peers and possibly even mentors who share your stresses, doubts, frustrations and fears every day. Take time out to cut loose together, even if it just means having a little fun at the express of your mutual grinds. What happens in Vegas, stays in Vegas. Let loose for a while knowing that you’ll leave it all behind in a few days. From good times to great ideas, that’s what any trade show in Las Vegas or anywhere else is all about: you’re spending money and time to better yourself professionally and personally. That means putting as much of a priority on a choice breather in the casino or at a show or two as you do on networking and learning. This is about you. Look at every moment as buying stock in your own betterment, whether it pays off in that instant or months or years down the line. I read this and thought it might be something for you. The post is called Great Things Entrepreneurs Can Learn By Attending Las Vegas Trade Shows & Seminar Talks and is located at https://motivationalspeaker.biz/great-things-entrepreneurs-can-learn-by-attending-las-vegas-trade-shows-seminar-talks/.